Blur are an Inglis rock baund, formed in Lunnon in 1988. 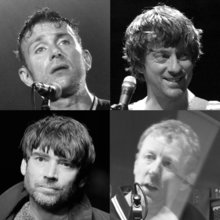 The group consists o sangster/keybuirdist Damon Albarn, guitarist/sangster Graham Coxon, bassist Alex James an drummer Dave Rowntree. This page wis last eeditit on 3 Januar 2019, at 08:15.